Two deep green, (nearly black), lampwork artglass beads with bright lime green spirals are the focus of this bracelet. Supporting these focal beads are bright Emerald green glass 8mm and 6mm round beads and three 8mm deep Emerald green beads. Two deep green, (nearly black), lampwork glass beads with a bright lime green spiral are the focus of this bracelet. Supporting these focal beads are bright Emerald green glass round beads and three deep Emerald green beads. Brass puffed washer style spacer beads are interspersed through the glass beads. A brass clasp, crimp covers and a whimsical smiling hand charm completes the design. The internal measurement is approx 18cm. 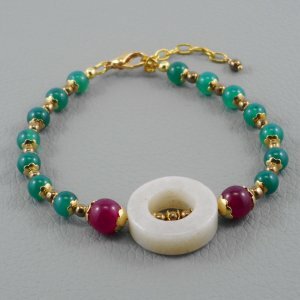 The Emerald green and brass Carlene bracelet is a great match to this design. They add extra oomph to each other when worn together.